The T40180 ... put to good use by operators in Oman. Bobcat’s new 14-m and 18-m telescopic telehandlers are proving their worth in the challenging environment of the Middle East. Since their launch at the start of 2014, the latest generation T40140 14-m and T40180 18-m telescopic handlers from Bobcat have been very successful in the Middle East. This is borne out by feedback from three new customers in the Oman capital of Muscat, all of whom have recently purchased T40180 models, their first ever Bobcat telehandlers, from International Heavy Equipment, Bobcat’s dealer in Oman. All three customers use their T40180 telehandlers for applications in the construction of houses, flats and other types of property. “The Middle East is probably one of the toughest environments for construction machinery in the world, with dusty, high temperature and high humidity conditions that provide a challenging environment every day, all year round,” says a spokesman for Bobcat. The first customer, Blue Crystal International, has had its T40180 telehandler the longest with well over 3,000 working hours already recorded. The company primarily uses the machine with bucket attachments but 20 per cent of its work is with pallet forks. “Blue Crystal International has been very satisfied with the performance of the new T40180 model and has found it to be a very agile machine. Operators report feeling more stable and consequently safer when they are operating the new Bobcat machine,” says the spokesman. 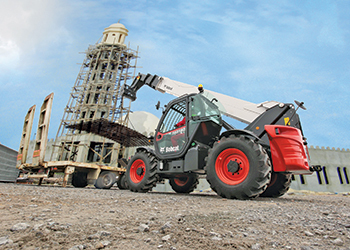 Abu Thalal Al Subhi Trading also has a T40180 telehandler and uses it in a similar manner to the machine at Blue Crystal International. The company believes the T40180 offers excellent driving and manoeuvrability and is very well suited to the contracts the company works on. Using the T40180, Abu Thalal Al Subhi Trading has been able to complete jobs in less time so the new machine has boosted business and provided an increase in investment return, the spokesman says. Malik Leeshanri and Partners is the third new T40180 customer in Muscat and primarily uses the machine with bucket attachments but also for lifting work with a hook on site and pallet forks for loading and unloading trucks. This is the first ever telehandler in the company’s fleet, which also includes backhoe loaders and excavators. Malik Leeshanri and Partners has found the machine to be very intuitive and simple to operate. The easy serviceability and maintenance have also significantly reduced operating costs, he says. Bobcat’s skid-steer loaders are market leaders not only in the Middle East but also all around the world and the same high performance, quality and reliability is available in the new generation telehandlers, the spokesman says. Since many electrical and hydraulic components are common in these machines, there are cost savings and other benefits for customers who have a mixture of Bobcat skid-steer loaders and telehandlers in their fleets, he adds. The T40140 and T40180 deliver market-leading load chart performances in their classes, when operating on tyres alone, where the high stability of the telehandlers ensures minimal loss of lift height and capacity. As a result, the T40140 offers the highest lift capacity of 4.1 tonnes, whilst the T40180 telehandler has an unmatched maximum lifting height of 16.2 m when operated on tyres, according to the spokesman. Like all new-generation Bobcat telehandlers, the new models are based on an easy-to-use design that provides class-leading efficiency and productivity backed by state-of-the-art safety systems. The hydrostatic transmission in the T40140 and T40180 provides a 95 per cent performance efficiency, providing high power coupled with low fuel consumption. The hydrostatic transmission makes it possible to place a load to the exact millimetre. In addition to precision, this is an important factor contributing to safety, particularly when loads have to be positioned at significant heights or distances from the machine, he says. Featuring optimised ROPS/FOPS (roll over protection system/falling object protection system), the new cab on the telehandlers offers increased safety and visibility through a curved front window providing a better view of loads and attachments at height; a larger back window increasing sight to the rear and a cab door with windows above and below the handlebar for optimum visibility when manoeuvring close to walls or other obstacles. Overall the new cab is designed to provide an exceptional work environment and a new higher level of comfort for the operator. From their comfortable mechanical or air suspension seat, the operator is provided with an array of machine controls within easy reach including a new forward/reverse (FNR) control button on the joystick; a new digital display; an adjustable steering wheel and an integrated airflow solution. The T40140 and T40180 also incorporate optimised electronics architecture. New generation hydraulic routings within the frame reduce potential leak points by 18 per cent and the hydraulic system also includes IP67 rated controllers on the hydraulic main valve. New-generation hydraulic and electrical systems enables optimum performance and extended machine life. A new cooling package ensures a smooth and stable control of the hydraulic oil temperature and optimises hydraulic hose life.